It’s the ultimate breakfast -- DONUTS. But is ultimate always good? Is all that glitters always gold? When I was a kid, my family bought donuts every now and then. My dad made sure of that. I remember his favorite -- Bavarian cream. Subsequently, Bavarian cream was my favorite, too. Even when I got older (11 years old), when my friends and I spent the night in our fort during the summer, we’d wake up in the morning and get donuts. I always got the Bavarian cream. Yum. My wife doesn’t like donuts, which means for the past 11 years since we’ve been married, I haven’t had a single donut. 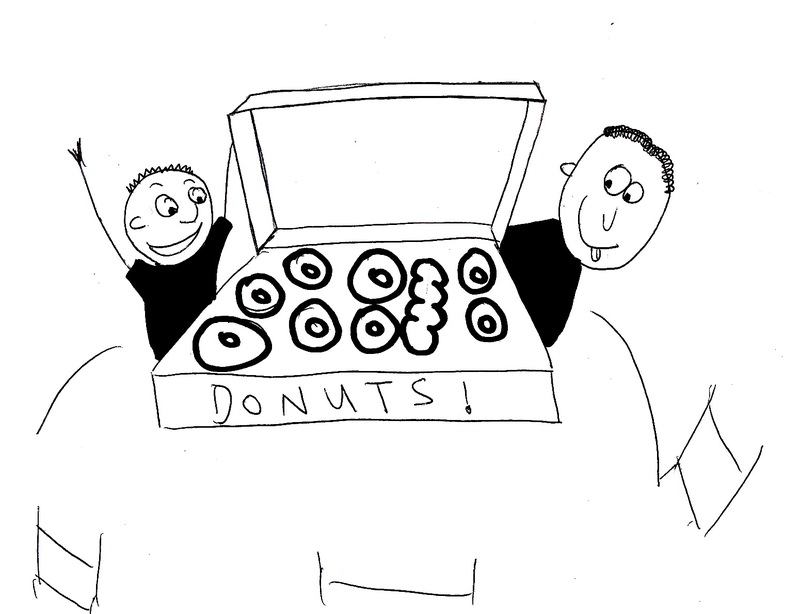 Last Sunday morning, however, around 10 a.m., my wife, 8-year-old son and I passed a donut shop. A giant poster in the window advertising Bavarian cream-filled donuts called for me. “What are we gonna do for breakfast?” I asked my wife. “We’re not having donuts,” she said, totally aware of what was going on in my mind. “But they’re so bad,” she replied. We got stuck at a red light, and that donut advertisement taunted me. “What’re donuts?” the 8-year-old asked. Poor kid had no idea. Her look said it all. I didn’t know I had it in me to so shamelessly manipulate her like that. To the donut shop we went. My wife sat in the car. The lady in the donut shop told my son and me that we could get a super baker’s dozen (14 donuts) for the price of six donuts. “But Mommy told us to only get six,” the kid reminded me. Six wasn’t going to work. I needed at least four glazed donuts for myself. It’s funny -- no one wants to admit that glazed donuts are actually the best. They always say they’re too plain. I used to claim that the Bavarian cream ruled the dozen, but I’d always grab a glazed first. And I’d always wrap up the “meal” with a glazed. I could no longer deny the power that that particular donut had over me. Breakfast is the most important meal of the day. It sets the tone for the 24 hours to follow. 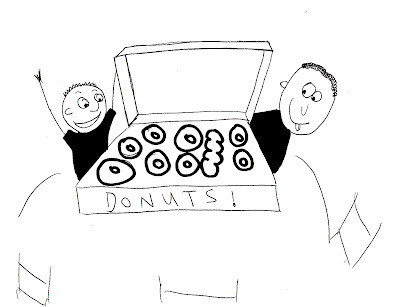 When my son and I picked our super baker’s dozen, I knew it was going to be a great day. For insurance, I ordered a somewhat healthy breakfast sandwich for my wife. And some fruit. That’d score me points. After I paid, my son saw a glazed twist that was hiding in the back of the display case. He said the glazed twist was going to be his favorite donut once he tried it. Donut Lady threw in two glazed twists for the kid -- free of charge. We left the store with the breakfast sandwich, the fruit and one big box of donuts. “What happened to ‘only six donuts’?” Mommy asked. She was actually upset, even though we got the six donuts like she requested . . . and 10 more. The entire morning was ruined. And it would most likely set the tone for the 24 hours to follow. When we got home, my wife ate her breakfast sandwich and fruit. My son and I didn’t touch our breakfast. I felt bad. I knew my wife didn’t want to be tempted by all that sugary goodness. When she was finished, I opened that big box. But, seeing the donuts, I couldn’t eat a single one. The guilt hung over my head. Then Mommy caught a glimpse of a rainbow-sprinkled donut. “Can I have that one?” she asked. That gave my son and me the okay to tear that box to shreds. Finally, after all these years, I had the donut feast I’d so been wanting. Four minutes and about 26 seconds later, after polishing off the last of the 16 donuts, I never wanted another donut again.